Emma is invited to be a bridesmaid in her friend Mia’s mother’s wedding. The problem is, Emma isn’t sure she can afford to buy the dress. She doesn’t want to ask her parents, since they are having enough problems with her Mom losing her job. 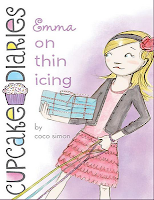 So Emma tries to manage earning the extra money on her own, by trying to fit babysitting her brother, dog-walking, and more business (extra baking) for the Cupcake Club into her already busy schedule of school and flute lessons. Can she handle the stress? This book caught my attention because I love baking and eating cupcakes! It was an easy and fun book to read, with believable situations and characters. I think 8 to 12-year-old girls would really enjoy this. 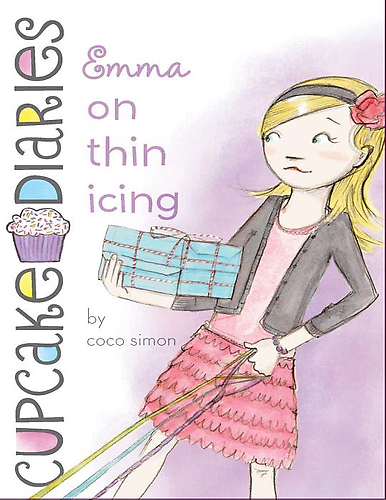 Emma’s problems were easy to relate to and the baking details made me hungry! 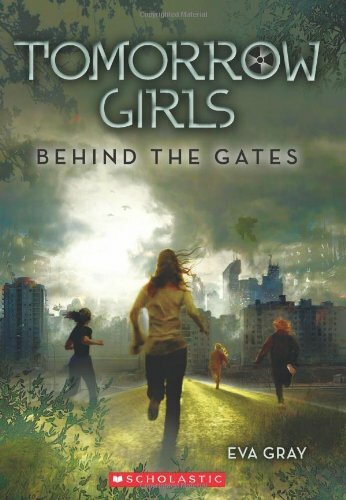 From a writing perspective, I’d look at more books in this series if I wanted to write a contemporary series for girls or a model for how to craft a basic plot with increasing complications. It’s interesting to see how to handle conversations with a group of characters at once, since that can be challenging to write. In the Cupcake Diaries series, four girls in middle school have small business making cupcakes, and each of the different books is told from a different character’s perspective. Although “Coco Simon” is named as the author on the Simon and Schuster website, it’s not clear whether she is a real person. For more, go to The Cupcake Diaries website. Happy Friday! I'm especially happy this week because I finally got through the first part of my revisions! It was the hard part, the part where I re-envison the story, adding in completely new scenes to keep up the tension and cutting out scenes that slowed the story down (or were confusing to anyone but me). I haven’t done much to celebrate yet, besides eating a gooey chocolate dessert and planning a night of doing nothing but napping and watching T.V. My family said, “Napping? You don’t nap.” Ha! I do if I’ve spent every waking moment (plus some when I should have been sleeping) on revising my novel. So, after that nap, I’m moving on to the next part of my revision process, where I work on revising for consistency. If you want to read more about that, I've blogged about it over at MiG Writers today. 1. Doing a little work on the book every day does eventually get me to the end. 2. Making big changes and taking risks leads to a much stronger story. Every time you write something, you're setting up a limitation or constraint that will affect the rest of the story. For example, in my earlier version, one of my characters was kept in a guarded room for some of the story. Re-visioning this situation to give her a bit more freedom opened up so many possibilities. 3. I use words like "much", "just", and "but" way too often. Descriptions that draw on the senses of sight or hearing sometimes seem to come more naturally than some of the other senses, such as taste. Even though taste can evoke powerful memories and associations, it's usually only related to eating and food (as follower Marcia Hoehne pointed out in commenting on an earlier post about writing with the five senses). That got me thinking. 6. Nervous behaviour - Some kids chew on clothing, pencils, Lego bricks, and other non-food substances. Write what comes naturally. Trying to put smell and taste in every situation will seem unnatural. Some settings lend themselves to describing tastes or smells more than others. Use it where it fits -- to introduce a memory, to add richness to a setting or situation, to bring out character. Use the emotion. Smells and tastes are strongly connected to experiences and feelings -- the cinnamon scent of grandma's cookies, the faint smell of your boyfriend's scent on a pillow, the antiseptic smell of the hospital where Dad was sick. Tying smells and tastes to feelings in your writing can strengthen the emotion. Make comparisons. There really aren't that many words to describe smells or tastes compared to vision, so it's often useful to compare an unfamiliar smell or taste to a familiar (and interesting) one. Be specific. Using a specific descriptor always creates a sharper image than a vague one. Think about the word "stink". "The stink of wet dog" evokes a totally different sensation than "smelly sock stink" or "onion breath stink". Character reactions. Reactions to smells and tastes reveal character. A fussy kid is bothered by strong tastes and smells. Some people are "supertasters" and react to even a hint of a taste. You can give your character an interesting quirk by giving him a specific smell or by having her always react strongly to a particular taste. Background and range of experience. Here I go again, talking about filtering everything through the main character's perspective. But it's so important for using tastes and smells effectively. Your character's background affects the way they experience the world. The expression "sour as a lemon" only works if your character has seen or eaten a lemon. Since I write MG, the smells and tastes I include need to be relevant to the age group of my readers - think "bubble gum" vs. "fine wine." Cliches. Be aware of whether your sensory comparisons for taste and smell are cliched. Sometimes you want them to be. "Sour as a lemon" evokes a specific taste and can get a point across quickly. On the other hand, using too many cliched expressions could make your writing seem stale or ordinary. Sensory overload. A choice word here or there can sometimes be more powerful than a long description. When writing for kids, go for a word or phrase with a strong image and leave out the wordy descriptions. How much detail do you need for each sense? Do you need to include all the senses in every description? Do you have any tips on using smell and taste in your writing? Have you read any children's books that are good examples of how to write with smells or tastes? *If you know of any other useful links about using the senses, let me know and I'll include them. Feed Your Senses and some ways to use Common Senses at Paranormal Point of View. Karen Strong has some great examples of effective scenes that use smell and taste. Some strategies for getting in touch with your senses at Adventures in Children's Publishing. Over at the Do It Yourself Degree in Creative Writing, you'll find some tips on using each of the senses in Writing Through the Senses. The Language of the Senses makes some interesting points about how the senses are handled differently in writing. Jess at the Falling Leaflets talks about writing with the five senses. Faith Hunter discusses ways for writing with taste and smell. Check out this in-depth article on writing with the sense of smell by Chip Scanlan. At The Bookshelf Muse, you'll find an invaluable resource for describing emotions, textures, weather, and settings. See also my posts on Words for Describing Smells and Ten Non-Food Ways to Use Taste in Writing. 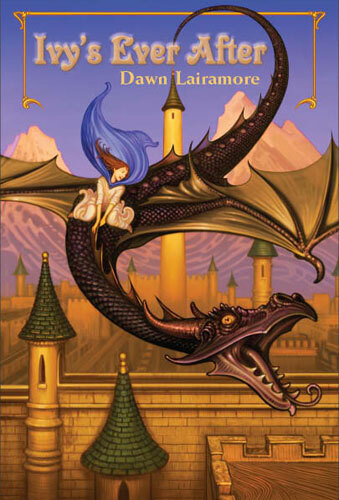 According to the Dragon Treaty, Princess Ivy of Ardendale must be locked in a tower on her 14th birthday, a tower guarded by a fierce dragon. She’s supposed to wait to be rescued by a handsome prince. But she doesn’t want to be rescued, and Eldridge, the dragon, isn’t cut out for guarding towers. Instead, they join forces on an adventure to search for Ivy’s fairy godmother in troll-infested mountains. This book was such a fun read! To me, it seemed perfect for 9 to 11 year old girls who enjoy fantasy and fairytales. It was great to see how the author blended humour and adventure in this story. This novel has a very definite and consistent voice, created through the fairy tale elements and the humorous writing style. There are a lot of descriptive, sensory details that worked to create a good sense of setting. I’d re-read this story to study how the author used adjectives and actions to develop character. There is a sequel to this book called Ivy and The Meanstalk. For more, go to Dawn Lairamore’s website. 1. In an interview for the Globe and Mail, Daniel Handler, author of Why We Broke Up and the Lemony Snicket series, says he thinks adults have always found children's literature appealing. "What happened with Harry Potter is that people started to admit it." But maybe it depends on the book format (see the comments on Adults Reading Children's Books?) Commenter Karen Strong says, "This is why I love reading on my e-reader because now people don't know!" 2. Have you heard these podcasts by Katie Davis? I just discovered them! Now I have something else to listen to while I'm mopping the floors. I'm always looking for more good writing or children's lit related podcasts. 3. Snow! After a weirdly rainy winter so far, we finally got a little snow. My kids were hoping for a snow day, but the grass isn't even covered yet. 4. Dog duvets that let you recycle old blankets -- I'm definitely getting one of these for my dog! Hope you had a great (and productive) week! When I write, I tend to rely on vision, touch and hearing. This helps me conceptualize the world my character experiences. I imagine the hazy sky as she tramps through the woods in the early morning and the way the long grass brushes against her legs as she walks. I can almost hear the rustling of her clothing and the birds calling to each other in the distance. By imagining myself in the situation, it's usually easy to find ways to describe sounds, sights and what my character feels. I find I'm less likely to think about tastes and smells without remembering to work at it. This surprises me, since smells and tastes are a huge part of my life. I'm usually the first in my household to notice the reek of the garbage or the soured milk. Have you ever examined your writing to see which of the five senses you include the most when you write? Which one(s) do you have to work at? It’s sometime in the future and the United States is at war with the Alliance. Louisa and her best friend Maddie (posing as Louisa’s twin sister) are lucky to have a place at an elite boarding school that will keep them safe. The school isn’t perfect. They have to surrender all electronic devices, jewelry, and their personal identification bracelets. They have strictly regimented chores and they’re not allowed to talk to the boys at the school across the lake. But Louisa enjoys the canoeing, archery, and other survival skills they are learning, especially when she discovers she’s a crack shot. Too bad her roommate Evelyn is so suspicious about the school’s true purpose. Then Maddie starts to get suspicious too. After Maddie gets in trouble, Louisa finds some hints about what is really going on. The four roommates will need to depend on each other if they’re going to survive. This is the first book in a four-book adventure, and a good introduction to the series problem and characters. 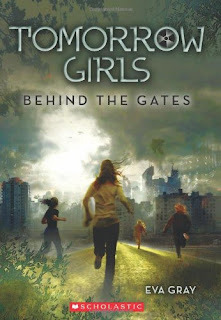 I enjoyed the fast pace of the novel, the dystopian elements and the interactions between the four girl characters. A strength of this novel is the clean, spare writing – a good model for how to write MG without a lot of description cluttering the story. This novel has been described as like The Hunger Games but lighter. Like The Hunger Games, this novel is written from a first person POV, in present tense. If I were planning to write using this style for MG, I’d definitely study this novel. I like the way the main character’s thoughts and feelings are integral to the entire story. The ending of this book leaves you hanging though and you need to read the other books to get the complete story. I couldn’t find an author website or blog, other than a basic list of the books at Scholastic’s site. One of the things I plan to continue with in 2012 is my 100 Book Challenge, where I challenge myself to read 100 YA and MG books in a year. This year, I actually read more MG than YA. Along with finding some really great books, keeping track of what I read has benefits, especially when people ask me for book recommendations for those age groups. The more MG and YA fiction I read, the more I realize how much I enjoy it. The stories are faster paced and usually always emotionally satisfying. There are so many good children's writers, I never feel that I'm missing something by not reading more books for adults. The biggest problem I have is when other adults ask what I'm reading or look at me funny when they see I'm reading a "children's book". I usually mumble something and quickly change the subject, as though there's something wrong with what I'm reading, when in fact, these are some of the best books I've ever read. This year, I'm going to work on being less self-conscious and start verbalizing more about why I'm reading the book and why I'm enjoying it. In case you were wondering, I do read some books written for adults too -- mysteries, chick lit, The Night Circus, cookbooks, nonfiction about health and food, and now, books that I can get on my Kindle (it hasn't replaced what I read in paper, just provided another way for me to find books to read). What do you say when another adult asks you about the children's book you're reading? Any advice? 1. Finish my latest round of revisions for Novel #4 (The Grand Chef's Apprentice). 2. Finish the big revision I started of Novel #3 (Wild Genius). I have a great outline waiting -- I just need the time and energy to do it. 3. Start something new. It seems like for the last couple of years, I've been working on the same old projects. Good for them, because they just keep getting stronger. I've learned a lot. But I still have a huge collection of story ideas growing in my notebook that I never have enough time for. When I look back on my goals for 2011, I see that #2 and #3 are pretty much the same as what I included last year. Aack! I think part of the problem is that I'm always revising something - the revisions never seem to stop. Oh well, that means I did accomplish one of my goals - writing more regularly. What are your writing goals for 2012? Did you accomplish what you set out to do in 2011 or did you have some unexpected surprises along the way? At the beginning of a new year, I always wonder what new challenges lie ahead. I'm almost afraid to look back on my accomplishments for the past year, thinking it will be depressing when I discover I haven't met any of my goals. The plot is nothing until the main character's experiences and thoughts make it come alive. Maybe that's a bit of an exaggeration, but one of the things that has happened in my writing this year is that I've gained a deeper appreciation for how critical the main character's perspective is to the story (thanks to Mary Kole, Cheryl Klein, the Plot Whisperer, countless blogs I've read, and working hard on my own writing). It seems like something obvious and basic, but the more I think and work on this, the harder and more challenging it becomes. Now, if only I could stop obsessing over whether each individual word fits the way the character thinks or acts, I might actually make some progress. What important thing did you learn about your writing in 2011? What aspect of writing do you hope to get some insight into in 2012?